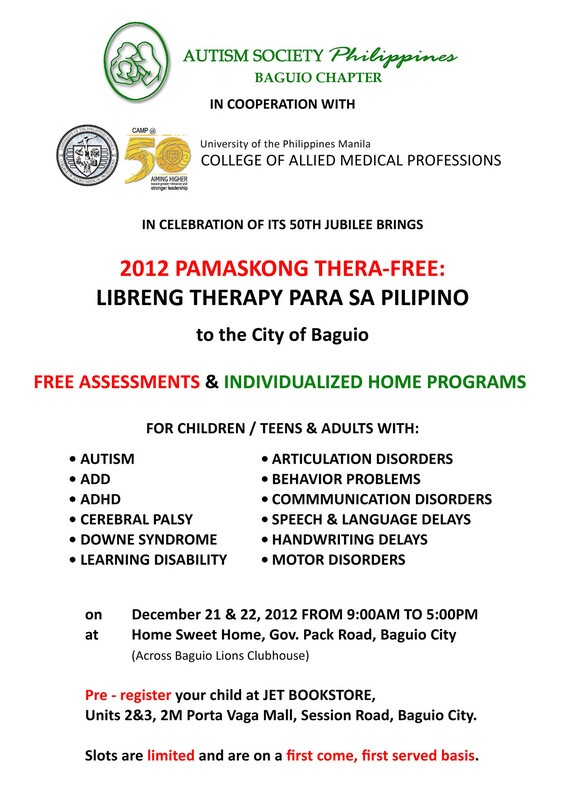 Autism Society Philippines Baguio Chapter in cooperation with University of the Philippines Manila College of Allied Medical Professions, in celebration of its 50th Jubilee brings 2012 PAMASKONG THERA-FREE: LIBRENG THERAPY para sa Pilipino to the City of Baguio. Free Assessments and Individualized Home Programs will be on December 21 and 22, 2012 from 9:00AM to 5:00PM at Home Sweet Home, Gov. Pack Rd. Baguio City (across Baguio Lions Clubhouse). Pre-register your child at JET Bookstore, Units 2 and 3, 2M Porta Vaga Mall, Session Rd, Baguio City.